The Porsche Boxster was lightly redesigned and renamed the 718 Boxster last year, with a new four-cylinder turbo engine replacing the normally aspirated flat-six, wider wheels with bigger brakes, and styling changes that made it look sharper and more muscular. 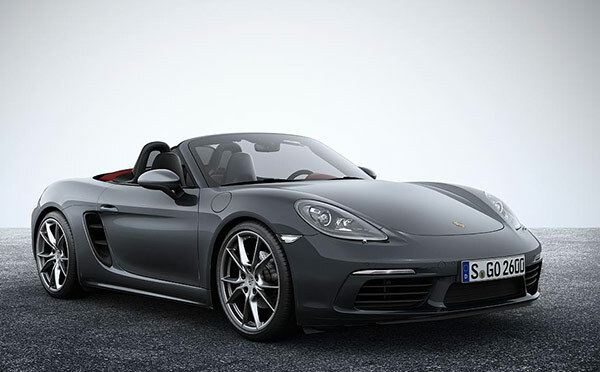 The 2018 Boxster lineup adds a new model with a bit more horsepower, the GTS, which comes with adaptive dampers, torque vectoring, sport exhaust, 20-inch wheels, synthetic suede or leather seats, and a thick steering wheel borrowed from the Porsche 918 with a mode selector that makes you feel like Lewis Hamilton. The standard mid-mounted engine is a 2.0-liter turbocharged flat-four making 300 horsepower and 280 pound-feet of torque. The S version is 2.5 liters, and makes 350 horsepower and 309 pound-feet. The new GTS makes 365 horsepower and 317 pound-feet. The 2.0-liter can accelerate from zero to sixty in 4.9 seconds, while the S chops that down to 4.4 seconds, and the GTS brings the time down to 3.9 seconds. The standard six-speed manual gearbox is sharp, while the seven-speed twin-clutch automatic manual is just as sharp but quicker. It’s Porsche’s racing-bred PDK transmission. The standard suspension is good but the available adaptive dampers are better. Available torque vectoring makes the 718 one of the best-handling cars in the world. The interior boasts beautiful leather and a multi-buttoned layout. There isn’t a lot of room inside but there’s a power convertible top to compensate. The 2.0-liter engine is EPA rated at 22 miles per gallon city, 29 highway, and 25 combined with the automatic transmission, and 1 less mpg with the manual. The 2.5-liter S versions get 24 combined with the automatic, and 22 combined with the manual. The GTS gets 22 combined with the automatic, and 21 with the manual. That’s 5 mpg less than one rival, the Mercedes-Benz SLC-Class. The SLC also offers a turbocharged six-cylinder that gets about the same mileage as the turbo four in the Boxster. The Boxster comes with a full complement of airbags, including front, side, and thorax. Automatic emergency braking, adaptive cruise control, active lane control and blind-spot monitors, are not available. The Boxster 718 roadster with manual gearbox has a base price of $57,400, the S model $69,800 and the new GTS $81,900 (the hardtop 718 Cayman is a bit less, at $55,300). But that price is stripped of all options (and not including destination fee); it’s not hard to hit six figures with a GTS having the flashiest options. Standard equipment includes power folding soft top, 18-inch wheels, sport seats with leather inserts, Bluetooth and USB connectivity, six-speaker sound system, 7.0-inch touchscreen for infotainment, and rearview camera. Boxster S adds a Sport mode, 19-inch wheels, upgraded sound system, and front and rear parking sensors. Expensive options include a deluxe Burmeister sound system, leather seating, wood or carbon-fiber dash inserts, high-tech Sport Chrono, as well as carbon ceramic brakes ($7,410), torque vectoring ($1,320), and sport exhaust ($2,900). In our view, the Boxster is the perfect-looking sports car, with its 2017 styling improvements. It rises muscularly from front to rear wheels, where it wraps around a tidy rear end. It remains clearly a Porsche. The GTS looks more aggressive, with 20-inch wheels and a ride height that’s nearly one-half inch lower. There is a plethora of controls and switches, from climate to performance, and it can be a bit overwhelming. But you might be calmed by the high quality of the materials, as well as the superb fit and finish, not to mention the ease with which the soft top drops into the trunk with the touch of another button, at speeds of up to 31 miles per hour. And few two-seaters can match the Boxster for comfort. There’s a lot of room for two passengers inside, helped by an adjustable steering wheel. There are four available seating situations, from the standard cloth bucket seats, to grippy synthetic suede, to plush leather. They’re all good, having a fit that is firm and not too snug. The total cargo space is moderate, with 5.6 cubic feet in the front trunk, and 4.4 behind the engine. The Cayman hard-top has the same in the front, but 9.6 cubic feet in the rear. One interesting option is Sport Chrono, a system that includes a stopwatch on the dash, with Sport+ driving mode that brings launch control, more aggressive throttle and transmission response, and stiffer dampening on cars with adaptive suspensions. That’s for the seven-speed automatic. For Boxsters with the six-speed manual, Sport Chrono adds rev-matching downshift. In a nutshell, the Boxster offers superlative engines, brakes, transmissions, handling and ride. With zero-to-sixty times for the three engines of 4.9 seconds, 4.4 seconds, and 3.9 seconds, you get fast, very fast, and awesome fast. The S and GTS, with their 2.5-liter engines, use different turbochargers called variable geometry; they spool up and bring the power quicker, while the turbo in the 2.0-liter engine has some lag. The standard six-speed manual transmission is crisp and direct, as good as they come. The firm clutch and tight short shifter work together beautifully. The optional seven-speed dual-clutch automatic is the famed Porsche Doppelkupplung, or PDK for short; bred from racing, it’s cleaner than the manual. With Sport Chrono system having launch control, the send-off from a standing start is perfect. The electric power steering is light and precise, with enough heft to tell the driver what the wheels are doing. The 18-inch wheels take Pirelli P Zero 235/35-ZR tires in front, and 265/45-ZR in back. The S model gets 19-inch wheels with 235/40-ZR1 and 265/40-ZR19 tires. The standard suspension with MacPherson struts is good. The optional adaptive dampers, which come on the GTS, uses Normal, Sport and Sport Plus modes. Sport is taut and Sport Plus is for the track. The feel of the brake pedal feel is superb, and the response immediate. The Boxster offers superlative engines, brakes, transmissions, handling and ride. There is nothing not to like.